One of our favorite cheeses is blue cheese and we especially like it with bacon. (Who doesn't love bacon?!). I had some ground beef to use up and realized it's been awhile since we had a good, comforting meatloaf. 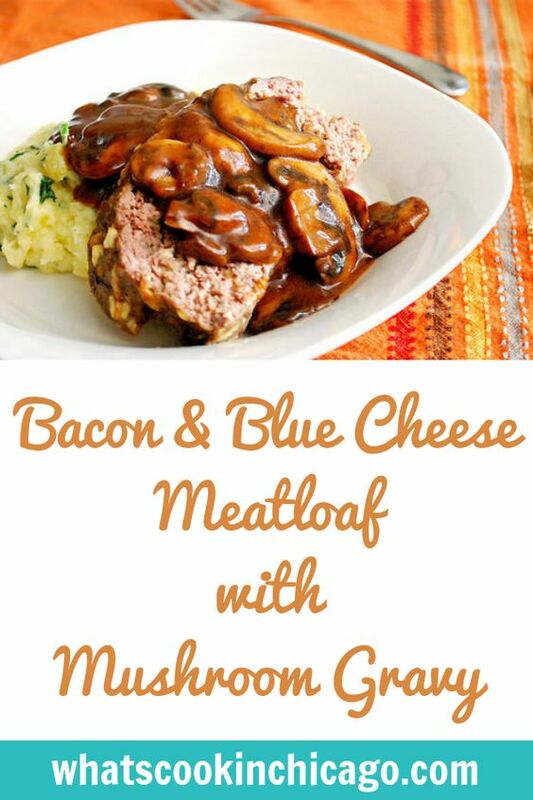 So with some of our favorite cheese and leftover bacon from breakfast, this Bacon & Blue Cheese Meatloaf with Mushroom Gravy soon became a delicious reality. A blend of ground meats with BBQ sauce, blue cheese and crumbled bacon gets formed into a loaf and baked. If that wasn't enough, the rich mushroom gravy puts it over the top! The interesting thing about meatloaf is that it can be a versatile dish using whatever you have on hand. The right blend of meat, binder and additional mix ins really allow you to make meatloaf whatever you'd like it to be! That said, the inspiration for this version comes from our favorite burger toppings - blue cheese, bacon, mushroom and bbq sauce. Rather than incorporating mushrooms into the meatloaf (which you can totally do if you'd prefer), I made a gravy so the flavors and texture doesn't get lost. We found the meatloaf to be even better as leftovers and made into a sandwich! Combine breadcrumbs and milk in a large bowl; let stand for 5 minutes. Add 2 tablespoons BBQ sauce and remaining ingredients except cooking spray. Shape meat mixture into a 9 x 5-inch loaf on a broiler pan coated with cooking spray. Spread remaining 6 tablespoons BBQ sauce over top of meat loaf. Bake at 350° for 1 hour or until a thermometer registers 160°. Let stand for 10 minutes. Cut the loaf into 12 slices and serve with mushroom gravy (recipe to follow). Add the mushrooms and cook, stirring occasionally, until a deep golden brown, about 6 to 8 minutes. Stir in the thyme and 1/4 teaspoon of salt and cook until fragrant, about 30 seconds. Whisk in the flour and cook for about 2 minutes. Slowly whisk in the chicken broth and Worcestershire sauce and bring the mixture to a boil. Reduce the heat to medium and simmer, whisking occasionally, until thickened, about 10 to 15 minutes. Season with salt and pepper to taste. 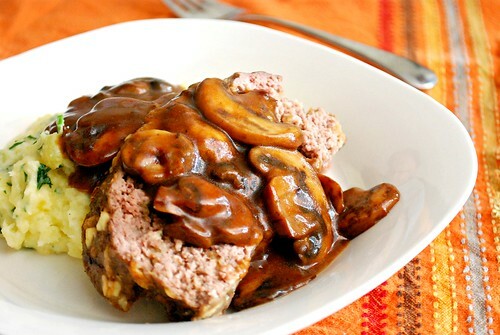 Slice the meatloaf and serve with the mushroom gravy.